If you are contemplating a lateral move, conventional wisdom dictates that you should keep your intentions confidential until you have accepted an offer at another firm. If your current employer learns that you are interviewing elsewhere, the effect on your career can be very negative. This is true both in the short run and in the long run. On the other hand, keeping your cards too close to the vest may prevent you from learning about good opportunities. After all, if no one knows that you are looking and no one knows that you are open to a potential lateral move, then you are less likely to learn about potential jobs. Clearly, it is important to properly balance the need for privacy in conducting your search against the realities of marketing yourself. The following is a list of common questions and answers that will help you achieve the proper balance. Ultimately, you have to decide what makes you most comfortable. Just keep in mind the old adage "no guts, no glory." But don't forget the other adage "loose lips sink ships." Is it okay to use office email in conducting my search? Many of the candidates that we work with choose to use their office email accounts. But the better practice is probably to use a personal account when communicating with recruiters, potential employers, and professionals in your network. While the risks of your employer perusing your email account are probably quite low, the implications of your employer discovering that you have been using office resources can be significant (and could potentially present grounds for dismissal). This of course has to be weighed against the inefficiency of having to check a personal email account on a regular basis. One solution is to tell people to call you on the phone when they send time-sensitive email to your personal account. Technically, you should follow the same rule for office voice mail that you would for office email. But if your voice mail is password-protected and you are the only one with the password, then the risk that an employer will monitor your messages is probably miniscule. Can I talk about my job search when I am at the office? Common sense is probably your best guide in answering this question. Timing and momentum can be important in a job search. Therefore, leaving all of your job-related phone calls for early or late in the day can put you at a disadvantage and add time to your search. But if your office walls are paper-thin, then you obviously need to be discreet. Try turning on some music. Get a white noise machine that you can keep on most of the time so as not to arouse suspicion. Some of the candidates I speak to prefer to use a cell phone to connect with individuals during a search (e.g., they move into a quieter conference room to make or receive job-related calls.) Personally, I believe that a cell phone is a poor substitute for a land line. This is particularly true when you are trying to make a good impression on someone you may not know that well. But again, this has to be weighed against the practical realities of privacy in your office. Is it okay to confide in one or two partners about my search? Speaking about your search with a partner at your existing firm is a very risky proposition. While a partner that you have a good relationship with may have every intention of giving you good advice, if you have been a key player in that individual's practice, it may not be in his/her interest to see you go. In addition, do not forget that a partner has a fiduciary responsibility to the partnership as a whole. But if there is someone at the firm who has been a good mentor to you, and you fully trust this person, then it can be useful to receive some guidance from this individual so that you can make better decisions. You will not be the first associate to leave the firm, and you will not be the last. If you have only worked at one law firm, then your only true references are the partners at your existing firm. But it is common practice to give an offer that is contingent on a positive reference from your existing employer. If a firm would like to check your references and you have had only one legal job, then it is perfectly reasonable to suggest that you would be happy to provide references once an offer has been made. 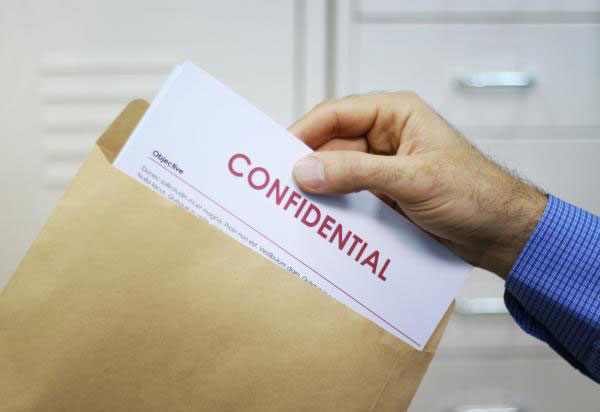 For the most part, firms will understand your continued need for confidentiality. If I send my résumé to a firm or to a recruiter, how do I make sure the firm or the recruiter will keep my search confidential? The only way to truly be certain that your firm never finds out that you are looking is not to look at all. Of course, avoiding a job search can be fraught with its own risks (particularly if you see work drying up in your department, key partners leaving for other law firms, or you have received less-than-stellar performance reviews.) If you want to have on the potential reward of a better job, then you need to take some risk in meeting the marketplace. Confidentiality is one good reason to consider working with a search firm (click here and here for other reasons.) If you choose to work with a search firm, make sure you know something about the firm's reputation and speak with the recruiter about the confidentiality issue. Make sure that the recruiter will only approach firms with your permission. If you approach firms on your own, make sure to remind everyone you communicate with (either in person or in writing) that your search is confidential. Just make sure not to come across as paranoid. If I am interviewing at several firms, do I need to disclose the names of these firms to everyone I meet? The bottom line here is that you need to answer questions in a way that feels comfortable and is not off-putting to the interviewer. While there is an argument that where you choose to interview is of no business to the firm, saying something like "Why do you need to know?" in a snooty voice will not win you a lot of brownie points. The key point to get across is that you are very interested in the interviewer's firm; but if pushed, it is probably the better to name some of the other firms. The legal profession has become highly mobile in the past two decades, and most law school graduates now understand that a first legal job is unlikely to be a final legal job. While there are some risks associated with conducting a lateral job search, these risks are manageable ones if you take the right precautions (e.g., working with a reputable recruiter). If you over-lawyer your own career and avoid acting because it is too risky, then you may miss out on some great opportunities. It is an occupational hazard that all lawyers must face if they truly want to control their own destinies.